There are several methods for navigating activities in GoNoodle. Each is accessed from the menu bar at the top of GoNoodle. Discover: Find new activities and recommendations based on your preferences. Refreshed weekly. Plus: Learn more about GoNoodle Plus (if a free user), or find all Plus content/features in one place (if a Plus user). Favorites: Access a list of favorite videos that you curate. Search: Search by keyword and advanced filters. Each view is briefly covered below. Pro Tip: Each view described below can be bookmarked directly for easy direct access. For example, if you wish to jump directly to the Category view when you log in, bookmark the Category page in your browser. 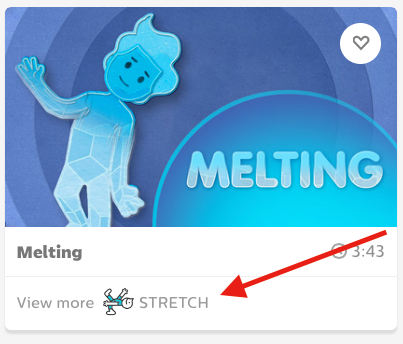 Discover is the first place you land when you log into GoNoodle. 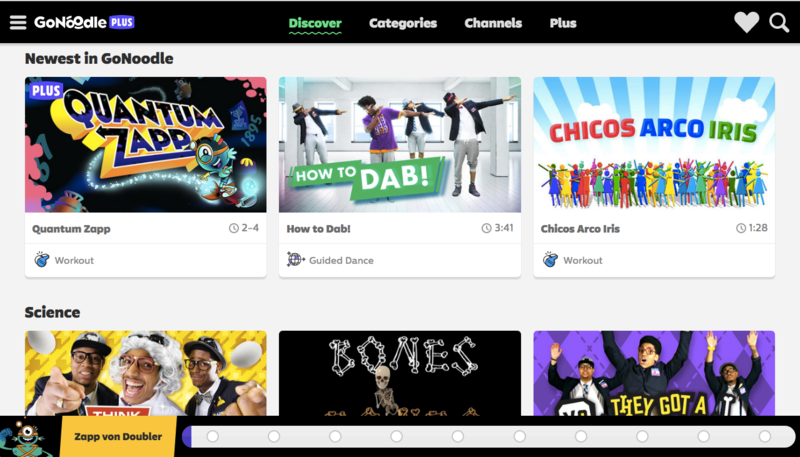 Discover is a dynamic page that changes with how you use GoNoodle and is updated weekly to feature fresh and timely activities. Scroll down this page to find activities you may not have played before. Pro Tip: at the bottom of the Discover page is a "Pick for Me" button that helps select a random video from the GoNoodle library. 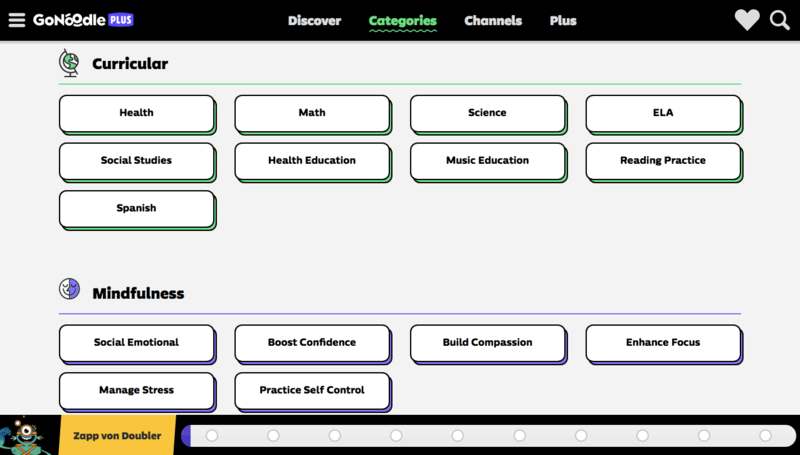 Note that categories include activities from multiple channels. Click the category button to view the content within that category. Note that you can also click the category label on any video tile to see all videos in that category. Channels are collections of activities organized by "artist". Click any channel name to see all activities in that channel. Hover your mouse over the channel for a brief channel description and a count of the number of activities in that channel. When you have access to the free version of GoNoodle, the Plus button allows you to learn more about GoNoodle Plus and start a free 30 day trial. Learn more in the Trial and Purchase GoNoodle Plus article. 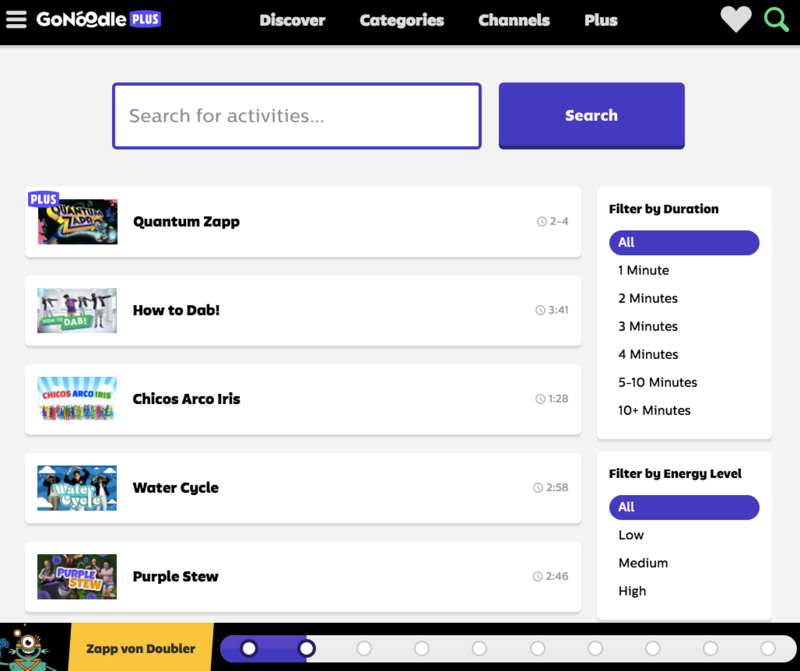 When you have access to the Plus version of GoNoodle, the Plus button takes you to the Plus Home where you can find all the features of GoNoodle Plus in one convenient location. Learn more in the About GoNoodle Plus Home article. Favorites allow you to create a list of your class favorites and access them with one click. See Favorite An Activity to learn more about using Favorites. Use the Filter by Duration and Filter by Energy Level on the right side to further narrow options. Note that you can use these filters without entering keywords to narrow activities by duration or energy level alone.